Last Wednesday was a bad day for Oregon’s school children. 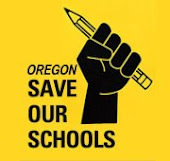 Oregon got their waiver from No Child Left Behind, and at the same time created a system even more likely to fail to truly educate our children. The waiver demands school personnel use standardized test scores as part of the evaluation for teachers. People who want to downplay this poor idea say it will only be one measure of the evaluation. But, it doesn’t take much thought to understand teachers will be pressured to heavily focus on this measurement. Now, poor test scores will not only give a teacher’s school a bad name, but the teacher as well. Oh, they probably won’t close the school down (though this is still a possibility); they will just brand the school and the people working there as failures. The major problem with all this is that the testing doesn’t correlate to good education. The easiest way to raise a school’s test scores is to act diametrically opposite of what creates a good education. School personnel need to teach to the test, narrow the curriculum, and spend time, energy and money on this effort. Test scores will go up if they do. This is pretty much a guarantee. But there is no guarantee that if you create a vibrant, comprehensive and relevant education your test scores will go up. For one thing, you won’t be focusing all your efforts on just grade level reading and math testing. You will instead want to challenge your students in such subjects as civics, geography, music, art, health, science, physical education, literature, writing, and a myriad of other interesting and important topics. You will also want to create enriching experiences which will help broaden your children’s horizons. It is also critical to help children begin to understand their place in the world and how to get along in it and how to make a contribution to it. And on and on. People might say that reading is fundamental to learning so we need to really focus there. Yes, we do. But high stakes standardized testing does not focus there. It focuses on a narrow spectrum which says you can take the test at a certain level, but not read at a certain level. It pushes all children into a box where they pass or they don’t. Bubble kids (those just below passing) become the most important kids in the system. Of much less priority are the kids who really can’t read or the kids who could read fine when they walked in the door. So we don’t really give kids who will be handicapped for life by poor reading habits and skills the attention they need. And we hold back those kids who could really move ahead and need diverse educational experiences to create stronger vocabularies and better understandings.